I can't help it.. 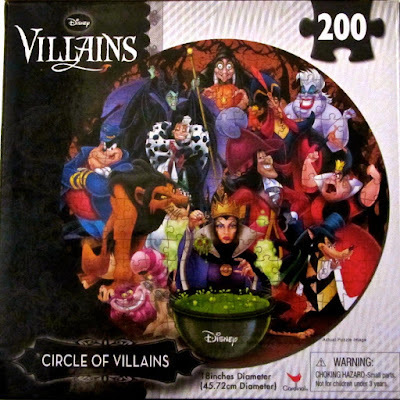 I have a soft spot for the Disney Villains. Now before you go thinking that I'm a little twisted and that I can't help but cringe when the princesses and animal's get their HEA, let me assure you, that is not the case. As a child, it seemed the entire household was able to recite The Little Mermaid word for word by the time I finally grew out of that stage (read: when I finally moved out of the house.) Ursula's "Poor Unfortunate Souls" was always my favorite. I'm sure I sang all the songs from the movie growing up, and let's just say there's a reason I pursued paper crafting instead of singing. Now this project is nothing too spectacular as far as skill level needed, but for me it doesn't negate the awesomeness of it overall! On one of my random trips to Walmart where I purchased everything but the actual item I went there to get to begin with, I found this little gem. I put it together almost immediately and Mod Podged the crud out of it before I could stop myself. I will say the lenticular printing aspect of it messes with my eyes every now and then, but I love it! 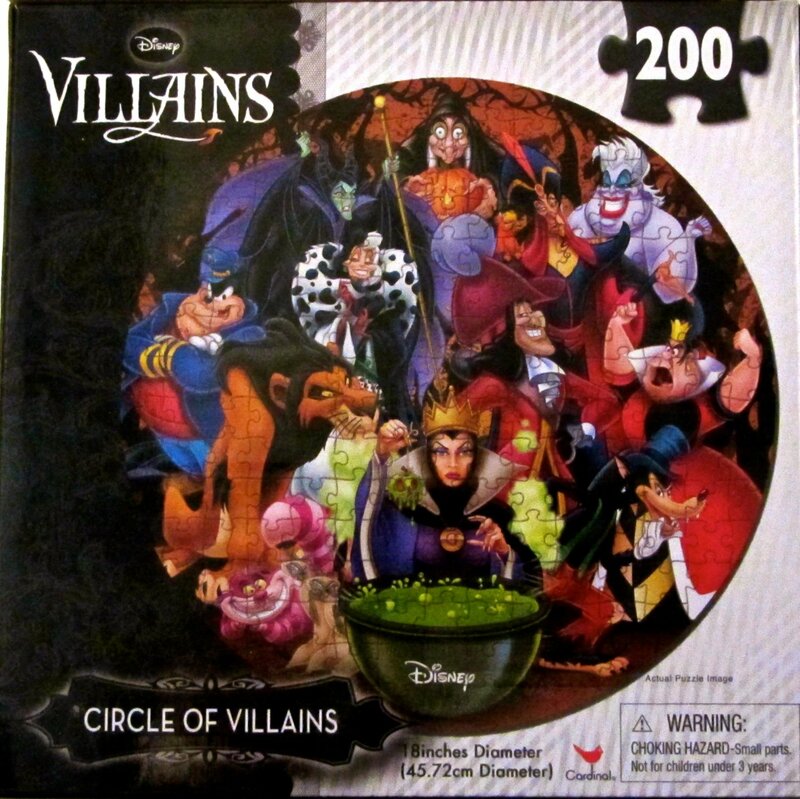 So, the Villains were are all together again and I had to figure out how I was going to display it! (I used to have the issue of planning every aspect of a project out first before I started - Murphy's Law was an ever present foe during that time - so now I just go with the flow , which can present its own set of problems.) 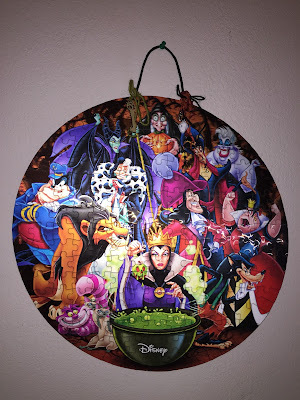 18" in diameter makes it a great size as a display piece, but kind of difficult to match with a canvas. Let's be honest here, I shop at Walmart (especially clearance,) I do not have the fundage to drop $40.00 on a custom rounded canvas. It just so happens that yesterday I went to Homegoods with my little girl and purchased a clear skull Halloween candle (because if you know me, you know Halloween is mah fave) and they gave me this ridiculously oversized paper bag to carry it in. Well, when I broke it down and measured it against the size of the puzzle, it's perfect! I traced the edge of the puzzle in the bag and cut it out. 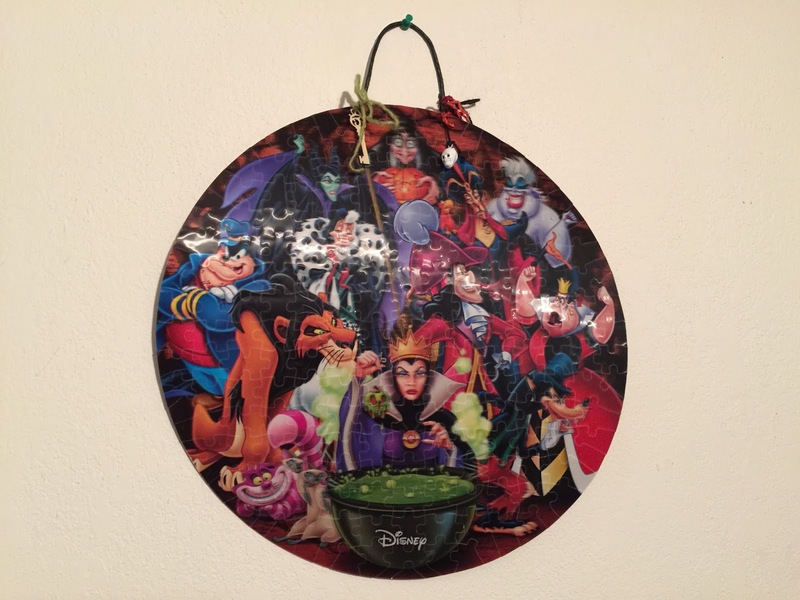 I even used one of the bags handles as the hanger for the puzzle. 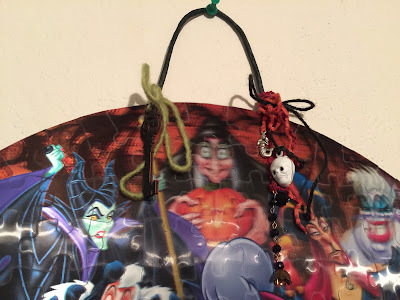 Beacon 3-in-1 holds the handle on and a moderate amount of Mod Podge was used to adhere the bag to the back of the puzzle. Throw on a few villainous charms, a black twine, green string, orange string, and red string, and voila! Despite the difficulty of the picture-taking, you can still see how it turned out! Ironically, I hung it up in my bedroom to take the pictures (after discovering my tabletop studio wasn't sufficient) and there it shall stay! On to the next project!!! Nice Amber! Oh yes, the Little Mermaid memories.....yeesh! Haha! Figured you'd cringe internally at the memory! This is so you! Love how you used your thrifty skills to make the perfect canvas!